The best church WordPress themes follow standards and best practices. They do this by supporting a WordPress plugin like Church Content to avoid theme-lock in. Theme lock-in is a common problem that most church WordPress theme buyers are unaware of. It’s a problem that can create hours of extra work down the road. The purpose of this article is to present you with the best church WordPress themes — those which avoid this problem. When a church WordPress theme is made following best practices, your church-centric content like sermons, events, people and locations are associated with a plugin instead of the theme itself. Imagine your content disappearing when you switch themes. As a result, you might find yourself manually re-adding 327 sermons! Instead, content should be associated with a plugin that remains active when changing to another theme that supports it. The best plugin for church WordPress themes to leverage is Church Content. This plugin is the most popular and highest rated sermon and church content plugin in the WordPress.org directory. It’s totally free. This is why multiple makers of the best WordPress themes for churches support it and why thousands of church websites take advantage of it. The first review it received was 5 stars from a man who literally wrote the book on plugin development. This article contains a list of all known WordPress themes to support the Church Content plugin. You will also find an appendix with information on how this article is different from other “best church WordPress themes” roundups, advice on choosing the best church WordPress theme and details on what theme lock-in is. Listed below are the best church WordPress themes. All of these avoid theme lock-in by following the best practice of using a plugin for custom post types. Included are some of our own church themes but it is mostly made up of themes made by our friendly “competitors” who share our Church Content plugin. Below is a legend explaining what the labels by each theme mean. Any Reason Refunds – Refunds given for any reason within refund period. 100% GPL – Licensed under GPL to offer same freedoms as WordPress. 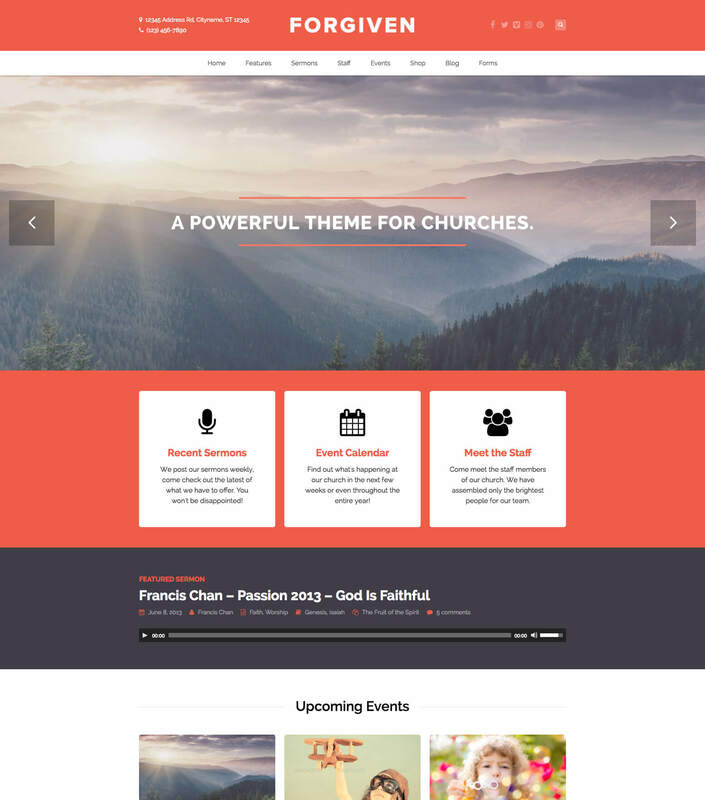 Church-focused Provider – Theme shop focuses only on church themes. CC Support – Church Content plugin features supported by theme (some support similar features via other plugins). Scroll down to Tips for Choosing the Best Church WordPress Theme for details. 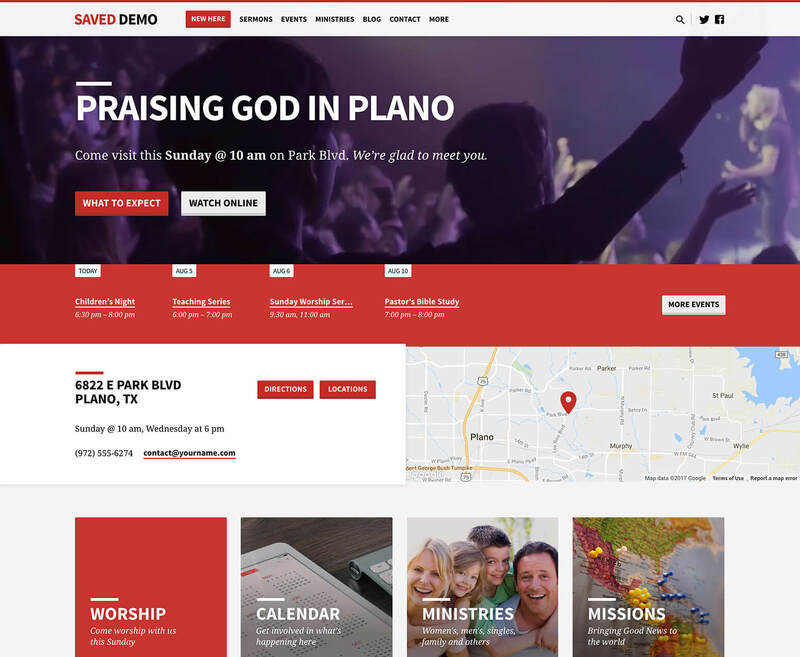 Saved is a church WordPress theme with a real-time homepage builder. Instead of requiring a complicated and expensive page builder plugin, it leverages core WordPress features. More specifically, this theme’s homepage is a widget area and each block of content you see on the demo homepage is a widget. This is a refreshingly simple approach, especially for beginners who want to do more without the learning curve. 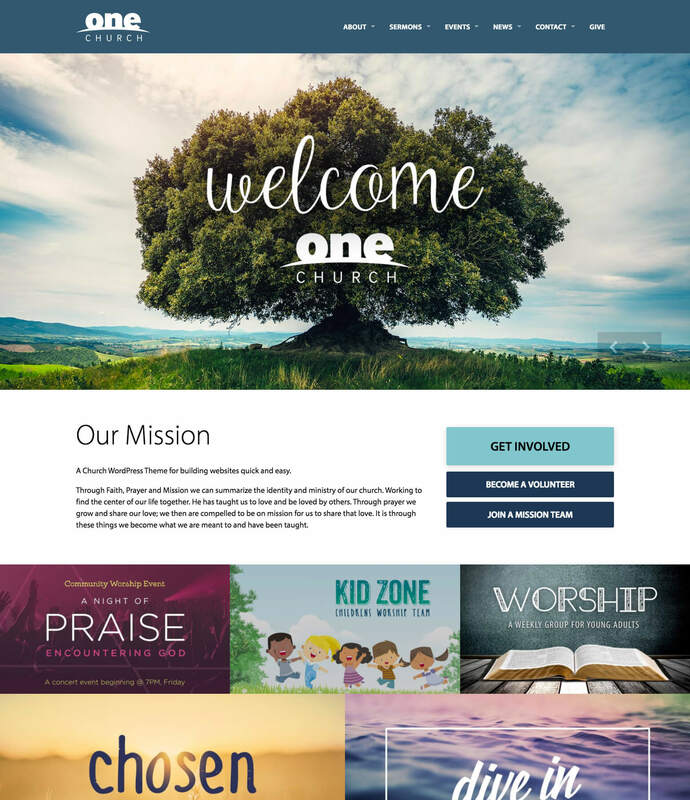 The homepage builder lets a church create a unique layout. What you see in the demo is one possibility but churches can create something very different if they want. Change the height of a section, add a background image, give it a colored tint — or use a video — and so on. The page builder works within WordPress’s Customizer which has a live preview. You can use any widget but the church-focused widgets the theme includes are especially nice and very customizable. Content plugin to present a church’s sermons, events, staff profiles and locations in a beautifully effective manner. A couple other features that stand out in this church theme are highlighted menu links (like the “New Here” button in the demo) and the fun-but-not-overdone animations that kick in on load and as the user scrolls. Custom color, font and other appearance settings can be tweaked as desired. Saved is an ultra-premium WordPress theme coming in at $129 which includes one-on-one support, step-by-step guides with screenshots, video tutorials, theme updates and sample content under a 45 day money back guarantee. 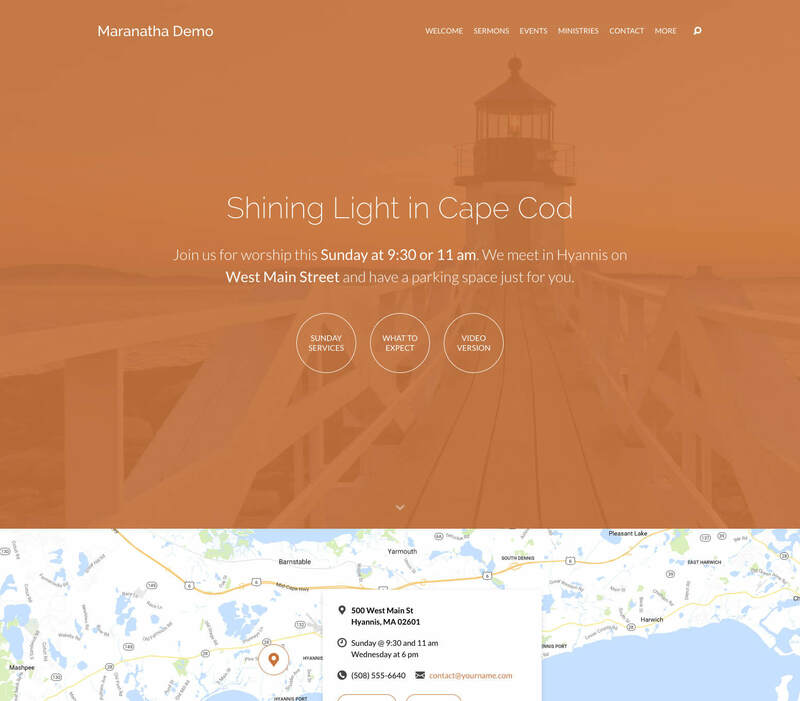 Maranatha is a beautifully innovative WordPress theme for churches. It has a long homepage with optional background video support and sticky menu bar. The menu stays in view while you scroll which is a great convenience, especially on mobile. Maranatha is optimized for today’s users. Maybe you’ve noticed most church WordPress theme have a slider at the top of the homepage. These look neat but research has shown them to be ineffective. User tend not to view anything but the first slide and become frustrated with automatic cycling when they are trying to read. As a more effective alternative, Maranatha has sections on the homepage. Today’s user scroll. Another feature that makes Maranatha one of the best church WordPress themes is the design’s focus on simplicity and readability. The content area is elegantly centered with a thoughtfully chosen font size that presents only a comfortable number of words per line. This also allows for photos and blockquotes to pop out by extending beyond the text’s content boundaries. Maranatha is a church WordPress theme so it has features churches needs. It doesn’t just provide sermons but also sermon indexes. For example, there are page templates that create a handsome index of sermon topics. Similarly, there are templates for listing series in chronological order, books of the Bible, speakers, etc. Maranatha is one of the limited number of WordPress themes with a monthly calendar view which is another reason it’s one of the best for churches. 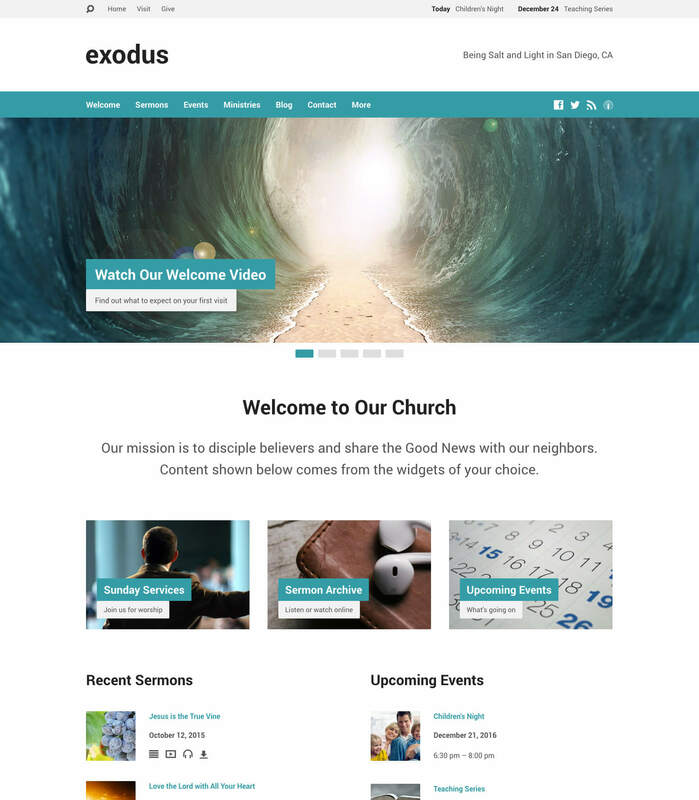 Exodus is a modern church WordPress theme with a wide, flat design. It is mobile-friendly like all themes from churchthemes.com (and most other church themes these days). The theme supports every Church Content plugin feature, including sermons, events, people (for staff and leaders) and locations. It is one of the best and most popular church WordPress themes of all time. It is very customizable and takes full advantage of the Customizer features in WordPress. You can change colors, fonts and upload your own logo. If you don’t have a logo image, you can simply enter text, choose a font and size. It automatically adapts your logo size to phone and tablet screens which make setting things up very easy. Remember, mobile usage is tremendously important. Two-thirds of Google searches start on phones. Like other church themes from churchthemes.com, this WordPress theme has an event calendar template. It also lets you list events in list format showing the soonest events first. And, you can categorize events which is great for separating youth events, children’s events, classes, etc. Further, each event shows a map with a button for directions and optional button for registration. Exodus has the full range of features for sermons that you would expect, including sermon podcasting. All churchthemes.com themes have a 45 day money back guarantee so your church can try without risk. 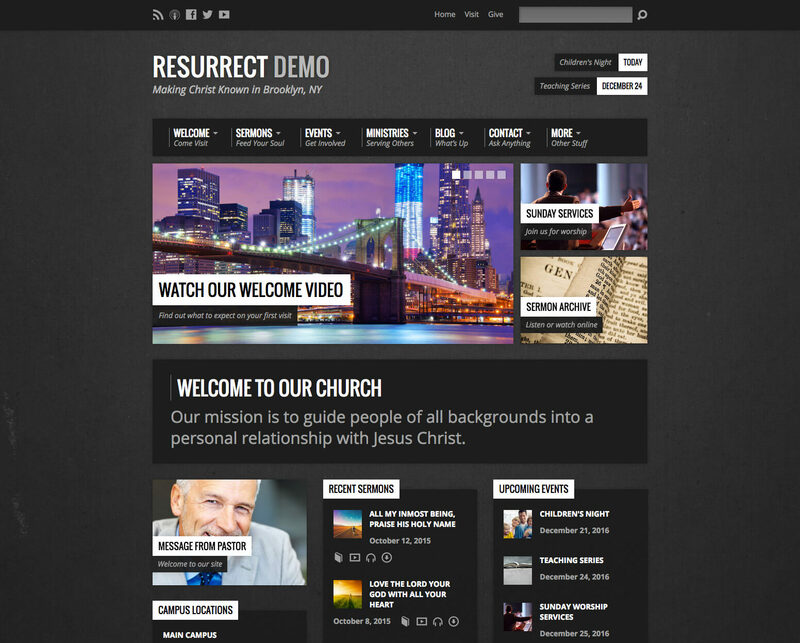 Resurrect is an urban-inspired church WordPress theme. It has a unique design and is especially suitable for churches wanting a bold and blocky appearance. With that said, it is very flexible – so much so that thousands of churches have installed it on their websites. You can adjust the logo, fonts and choose from a dark or light color scheme. Choose a color for the background, use one of the included images or upload your own. The best church WordPress themes are mobile-friendly. One term you might see thrown around is responsive design (meaning the design adapts to any screen size automatically). Resurrect has a responsive design and a beautiful mobile menu to help people find your church from their phones. See a photo of the Resurrect theme in use on a phone to your right. In addition to supporting sermons with audio and video support, series, speakers, books, etc., Resurrect and the other themes by churchthemes.com have a template that assists with automatically listing your ministries. Your church can also launch a blog, setup online giving, show photos and list multiple campuses. One other things to note is that the design is crisp on high-resolution displays which are now becoming popular. A theme has to be specially prepared for this to be the case. churchthemes.com themes have anticipated and been prepared for this trend for a long time now and are ready to go. Nothing looks better than the sharpness of a new church website using a Retina-ready WordPress theme on a modern screen. One Church is one of the more exciting themes to come out lately. It most definitely qualifies as one of the best church WordPress themes. Recently, Parallelus acquired UpThemes. Their first order of business was music to my ears and that was to make a new WordPress theme for… churches. One Church is the result. You can see from the screenshot above that it is a beautiful theme. It supports every post type of the Church Content plugin. That means you can switch to and from any theme that supports the plugin (even from different providers) with little effort. Not only is it a well-designed theme but it has some features in addition to sermons and events that are worth noting. First, it has features for SEO (Search Engine Optimization). When a theme description says that, it’s usually hot air because SEO is mostly a matter of your content, not what a theme does. But with One Church, it has features to help Google take better advantage of your content by leveraging structured data (geeky details) for rich snippets in search results (e.g. showing event dates and times). This is the real deal. The other feature worth noting is Beaver Builder support. There are several reasons I’ve never been a fan of drag and drop layout builders but of all the plugins that provide layout building, it’s clear (from what I’ve heard) that Beaver Builder is one of the better options. If you want a church theme with drag and drop layout building capabilities, One Church is your best bet. Steadfast is the second release from ThemeBright. 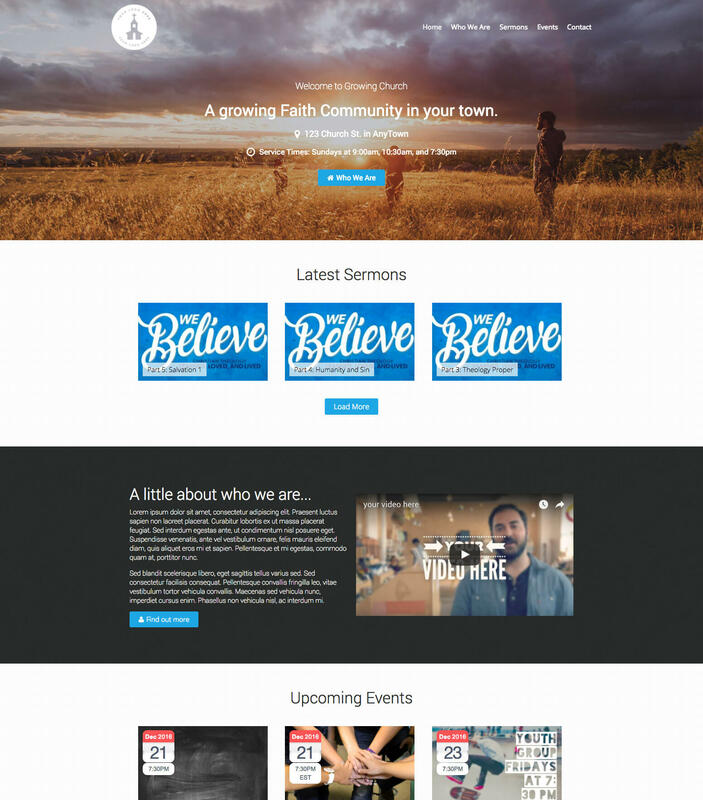 ThemeBright is Galen Gidman’s up and coming church WordPress theme shop. It’s always great to see someone focusing specifically on WordPress themes for churches. And they’re not just church themes, they’re some of the best church themes. This theme’s design is clean. It is elegant (and knowing its maker, so is the code). Don’t be fooled by its minimal appearance; all the church-centric features you need are supported. You can publish a sermon archive, list your events, setup online giving (using the Give plugin, which the theme supports out of the box) and create a directory of church staff. I recently heard a report of a church’s staff pages being some of the most viewed on their website, so this is important. Other features of Steadfast are Customizer settings (logo, social media, fonts, color), multiple campus support, and WooCommerce. Only a few church WordPress theme support WooCommerce so if your church needs to sell goods on its website, this theme will be one of your best options. Others that support WooCommerce are Wise Church and Forgiven themes below. Be aware of ThemeForest’s refund rules. It’s not a marketplace that processes “for any reason” refunds. Two examples of why a refund may not be given are “the item did not meet your expectations” and “you simply change your mind”. Restful is without a doubt the single best free church WordPress theme. It is available on WordPress.org which means to install it, you can simply search for it within your WordPress admin area. 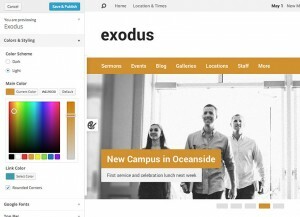 What makes it best among free church themes is that it supports all four post types of the Church Content plugin: sermons, events, staff and locations (even multi-campus), for free. This had originally been sold on the ThemeBright website for $99 but it was decided to offer it for free and as of writing it is in use on more than 500 church websites. What a great deal and a great help to churches needing a functional website but not having a budget to spend even $99 for a premium church WordPress theme. It really is a full-featured theme without the price tag. Since it is free, don’t expect a great deal of support. You may get some help but free themes and plugins are obviously without that guarantee. Support has a cost. If you want support from ThemeBright, I recommend their other theme, Steadfast (scroll up). With that said, this is still a great choice if you have some WordPress experience (or are willing to get your hands dirty learning). You may not need the level of support that paid themes usually include. 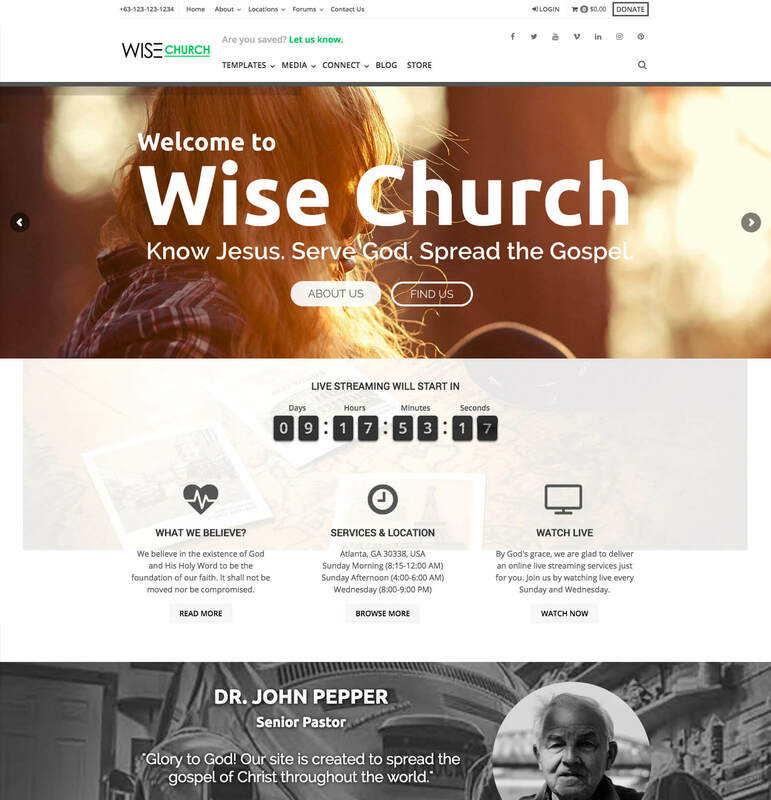 Wise Church by Probewise is one of the best church WordPress theme sold on the ThemeForest marketplace. You can use it to present your pastor’s sermons, church events, staff and locations. You can also publish a blog (true of any church WordPress theme). What stands out is its support for live streaming with a countdown timer and live chat (via plugin). You can communicate with online church attenders using this. This theme has a flexible homepage with animations that trigger as you scroll. You can show things on the homepage like news and blog posts, photos, ministries, upcoming events and sermons. Widgets can also be shown in the footer as well as a newsletter sign up and map. Another feature that makes Wise Church one of the best church WordPress themes is the ability to filter sermons by speaker, topic, book and series. You could filter all sermons on Corinthians by a particular speaker. This is a great feature, especially for larger sermon archives. There is virtually no limit to the number of sermons you can publish with WordPress so if that is your church, consider this theme or one of the others that deals with topics, series, books and speakers (which is most that are using the Church Content plugin). One more thing that is noteworthy about Wise Church is its nice sample content. Forgiven is another church WordPress theme by Boxy Studio sold on ThemeForest. More than 1,000 churches have purchased Forgiven. Based on its nearly 5-star rating, it’s clear that the churches using it consider it to be one of the best church WordPress themes. It has a lot of the same features as the Eden theme but with a different design. The design is equally impressive. It sports a custom “blur” slider and also includes the Soliloquy slider plugin. It supports the popular Visual Composer layout builder plugin (also included). This is a great deal of value for the money, making this one of the best packages of church WordPress tools around. In addition to supporting these plugins and Church Content plugin’s sermon, events and staff features, it is made with other plugins in mind. For example, it works with WooCommerce, The Events Calendar, Gravity Forms and Contact Form 7. Supporting plugins is the right way to make a theme. If you switch themes, you can still use all of these plugins. If these features were baked right into the theme itself, you’d lose. No lock-in effect with Forgiven. Boxy Studio has done things well and made Forgiven one of the best church WordPress themes available. 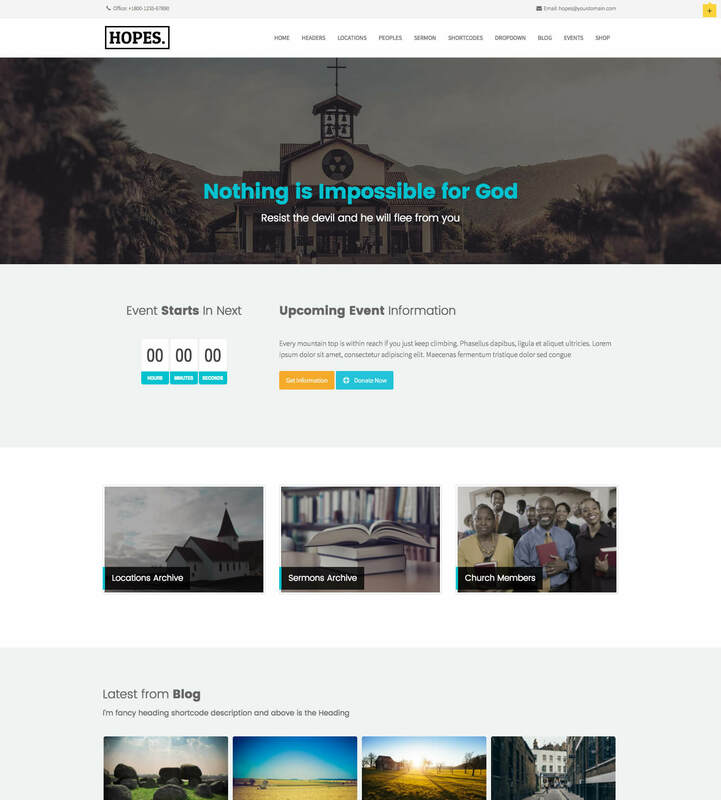 Hopes is yet another full-featured church WordPress theme making the “best” list. It is made by Aivah Themes and sold on ThemeForest. As of writing, it is only $36. ThemeForest recently made it possible for theme sellers to set their own prices. As such, you may have noticed that prices on that marketplace are both higher and lower, depending on the theme. 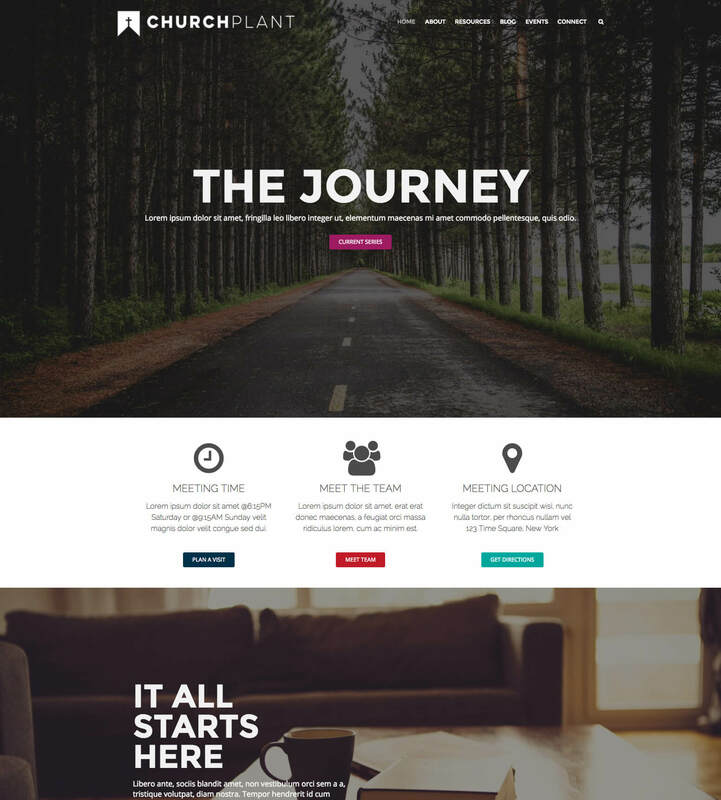 Aivah Themes is one of the theme authors that has opted to go for a lower price. It used to cost more. You can see by its ratings on ThemeForest that the churches using it like it. If you take a look at the demo, you can see some of its key features in action. Looking at the homepage, there is a slider, countdown timer, upcoming event information and boxes highlighting the sermon archive and locations. It also shows blog posts and demonstrates a giving feature. The footer can show service times and tweets. The homepage and footer are widgetized so you can change what shows to your church’s liking. The theme’s official description states a built-in shortcode feature. This is the only thing to look out for. If it is in fact built into the theme and you use the shortcodes then switch themes, the shortcodes will stop working (theme lock-in). Double-check this with the seller before buying if you plan on using shortcodes. 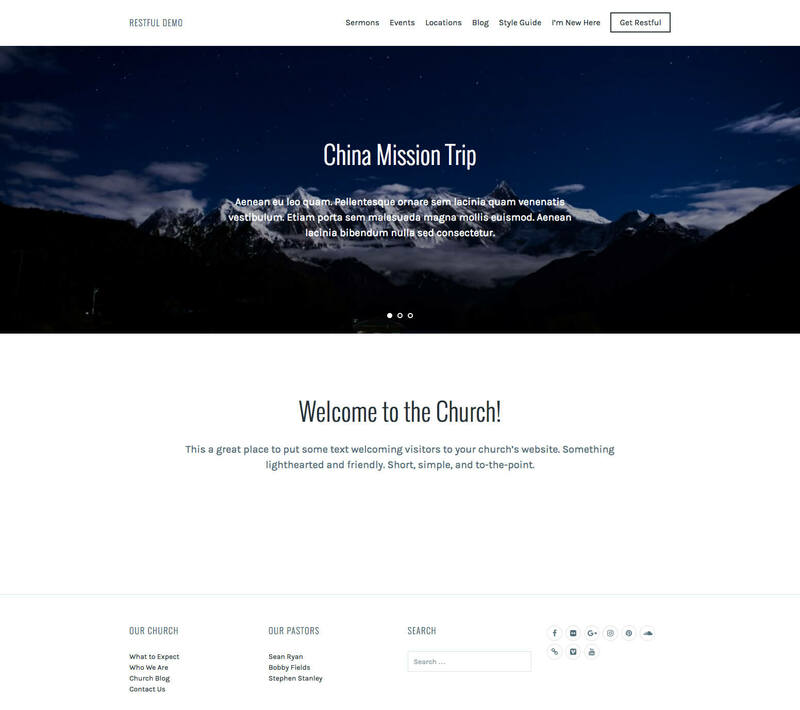 It is an otherwise attractive theme with great features for church website. The Church Plant bundle from Mint Plugins is more than a theme. As you can tell from its name, it’s a bundle. Included are the ultra-flexible Knapstack WordPress theme and the MP Stacks plugin. The MP Stacks plugin is a page builder plugin. It lets you create flexible page layouts by adding and organizing “bricks” to create a “stack” with a few clicks. Ten pre-designed stacks are included. The sermons feature from the Church Content plugin is supported. Other features come from the theme and the add-ons that it includes (15 add-ons). One such add-on is the SermonGrid add-on which helps you present sermons added in the Church Content plugin. Users can filter sermons by topic, book, speaker or series. The EventGrid add-on provides recurring events. The demo photos are included as well, which is not common (licensing costs). When you import the sample content, it looks exactly like the demo, photos and all. This gives you a great starting point for your church website. This is a very good value. While Knapstack is not specifically a church theme, when the bundle is considered, it is easily one of the best “church themes” out there. The idea behind the Restore Church Bundle is the same as with the Church Plant Bundle from Mint Plugins. These bundles use the same theme but are incredibly flexible in terms of design, as you can see from the demos. The included MP Stacks plugin is what makes this possible. This is a page builder plugin with add-ons for things like sermon presentation and recurring events. The sermon management is powered by the Church Content plugin. You enter your sermons in the WordPress admin area and Mint Plugins presents them on your website using their tools. The included Knapstack theme and MP Stacks plugin are mobile-friendly. Give the demo a look on your phone to see this in action. Other notable features are customization options, newsletter sign up, Google Maps and social icons. This bundle is licensed for unlimited sites so if you build church websites for clients, this could be a valuable part of your toolkit. It is one of the best options for church WordPress theme shoppers. Similar to the other church bundles from Mint Plugins, the Growing Church Bundle includes the Knapstack WordPress theme and the MP Stacks plugin for creating custom page layouts. This is essentially a pre-made church website including all the tools you need for sermons and events. This is one of the best WordPress-based church website kits you’ll find. Seven pre-styled, reusable “stacks” (layouts) are included for you to use and customize for any page. Twelve add-ons for the MP Stacks plugin are included as are rights to use background images from the demo. Sermons are powered by the Church Content plugin. Other features come from Mint Plugins’ included add-ons and WordPress itself. Google Fonts is supported. This allows you to use custom fonts in different places. Additional customization features exist for colors and backgrounds. Even more features include parallax sections, MailChimp sign up on your homepage, multiple widget areas, an Instagram feed and events with recurrence options. I see a lot of “best church WordPress themes” roundup articles but there are generally several problems with them. They don’t regard avoiding theme lock-in as prerequisite for “best”. It’s not their problem when you end up spending hours or days re-entering your church content a year or two from now. This is also an issue that flies under the radar so the writer may be unaware of the problem. Their criteria is earnings potential (ie. commission and/or selling the top spots on the list), not necessarily which WordPress themes are the best for churches to use. Selling top spots on a “best” list is obviously a questionable practice, but not one I’ve seen challenged yet. They’re too limited or outdated. A great deal only include church WordPress themes sold on ThemeForest or overlook theme makers not offering commission for referrals. A list from 2014 is not very helpful. This is the kind of list that needs to be kept up to date. This is not to say that all “best church WordPress themes” lists are useless. It’s helpful to see multiple church themes (or hotel, restaurant, etc.) in one list. Just keep these thing in mind when reading roundups. This list is different in that it presents your best bets for avoiding headaches later. The best church WordPress themes adhere to standards and follow best practices. I also want to provide some tips for choosing the best church WordPress theme for your website. If you’re unsure about any of these, ask the theme seller. They should be happy to answer your questions before and after buying. This is a summary of our How to Choose a Church WordPress Theme article. Read it if you’d like more detail on these points. Does the theme avoid the lock-in effect? You don’t need to ask because the answer is yes for all of these themes. This is the primary criteria for this list. Does it support features your church needs? See the demo to get an idea of how well the theme presents things like sermons, events, people/staff, locations, ministries, forms, online giving, etc. (using the Church Content plugin, other plugins and core WordPress features). Is support included and documentation thorough? Guides with screenshots and videos are helpful. See if their guides are publicly viewable before purchasing to get an idea of how in-depth they are. Also look for their target response time (within one business day is very good). Is the license 100% GPL? You may have to ask. If it isn’t, you are not receiving the same freedoms with the theme as you are with WordPress itself and the WordPress Foundations wishes are being violated (in some cases, the law may be violated). ThemeForest themes are usually “Split GPL”, not 100% GPL. Does the provider focus only on church WordPress themes? A theme maker who only deals with churches will have a better understanding of what churches need with regard to features and support. Most theme shops tackle multiple niches but some are focused specifically on churches. Is there a money back guarantee? A theme shop has no real reason not to provide refunds so check that before buying. If refunds are not offered with no questions asked (for any reason) or require special approval, that’s a red flag. It only takes us a minute to process a refund. It’s a digital product so there’s no problem doing that. Is the provider’s business model sustainable? You don’t want to be left unsupported and out of date when a seller fails because of an unsustainable business model. Ongoing support and lifetime updates have ongoing costs (optional renewal is common). Be wary of “lifetime” and “unlimited”. Theme lock-in is not specific to church WordPress themes. It can happen with any WordPress theme. It’s simply a matter of a WordPress theme developer being unaware of or too lazy to care about what themes are for (presentation) and what plugins are for (functionality). In short, anything that a website owner expects to keep when switching themes should come from a plugin because when you switch themes, your plugins remain. To use WordPress for a church website, you need support for things like sermons, events, staff and locations because WordPress by itself only has pages and posts (these are “post types”). WordPress allows developers to register custom post types which is what has made WordPress useful for virtually all kinds of websites. For example, a church website will need a sermon post type. If a theme registers a sermon post type, it only exists while that single theme is active. Consequently, switch themes and your sermon post type vanishes. You can’t manage your sermons in the admin area or view them on the website with a different theme. Obviously, this is a big problem and one that can lead to the church having to re-add hundreds of sermons (and other church-centric content), one at a time. Unfortunately, this is time-consuming and expensive. And, it shouldn’t happen. The church unsuspectingly purchased a WordPress theme that was doing what only a plugin should do. Themes should never register custom post types. If the theme had instead supported the Church Content plugin’s sermon feature, the church could have switched to another theme that supports the plugin in a like manner and not had to re-enter any content. This is what makes the best church WordPress themes the best. Read our Avoid the Theme Lock-in Effect article for more. I hope you found something your church likes. If so then what’s next for you is to build your new church’s new website with one of the best church WordPress themes. The provider of the theme you go with should have a guide (probably something like this) to walk you through getting setup. Before you launch, be sure to read two of our most important articles: Content Your Church Website Must Have and Eight Things You Should Do After Building Your WordPress Site. What’s next for me is to keep this article updated. I’m always excited to see a new church WordPress theme leveraging the Church Content plugin. I hope to see even more support it as time goes on. If you know of other church WordPress themes that use the plugin, please post a comment. I would love to add it to the list for churches to consider. Steven, super solid list of themes here, I use many of them with my clients already. Here’s the deal though…I really appreciate the talk about theme lock-in, it is a big deal with churches. That said, even these themes are a modified lock-in—but more of a plugin/theme lock-in. If you want your content to travel with you with ease, you have to stick to the short list of themes that support the Church Themes Content plugin. It is a super solid plugin and I appreciate it, but using it does really narrow your options. I wish it didn’t…so for many of my sites I build I’ve been using Series Engine. It too isn’t without plenty of faults, but it will travel to practically any theme. Thank you for using our themes and for always pushing us to improve. As soon as WordPress offers themes the ability to provide a generic template so that plugins can create sermon archives and single sermon pages that match the theme’s design, we’ll be all over it. As it is now, archives and single posts are theme territory so the options for a plugin are to 1) Hack it (generally unattractive and unpredictable) or 2) Skip it altogether (ie. use a shortcode as workaround – an incomplete solution). Neither of these options are acceptable to us because design quality, stability, compatibility with other plugins, and/or SEO take a hit. There really has to be a single post for things like SEO and for a lot of other plugins to work (e.g. social sharing). Our approach while we wait for WordPress to assist with this dream has been to require themes to provide specific support. The result is a much more functional and attractive website. The con is that while the user is not limited to one theme or even one provider, they are limited to themes that support the plugin (a growing selection that had to start somewhere). What makers of sermon plugins who want to hack it or just use a shortcode can do is create an importer. I’m sure they’ll do that if there is ever a demand to move from our plugin to theirs. There’s always some type of lock-in effect at some level (ideally only at plugin level rather than single theme level). Every WordPress product maker can make sure lock-in is never at the theme level. That’s the too-common problem we’re helping with. I’m open to any ideas you have to pull off universal theme support for custom post types in a stable, attractive manner without jeopardizing SEO and the functionality of other plugins. We’d love to do it before a generic template is available if at all possible. We gave it two stabs and are pretty convinced it’s better to wait and do it the right way than to make sacrifices by hacking it now. But, an elegant solution now would be music to our ears. We’d love to help churches use our features with any theme. Nice article and a good list of themes… I agree with the above comments and wonder how the content plugin can be implemented with more themes? I am not a designer, just a retired guy trying to help a local church. I use Beaver Builder to layout the design and their theme which is clean and generic. My question is how can I integrated the content plugin in an easy way? is there a way to have the plugin use the WP customizer with any theme like a child theme concept? Like I said I am not a designer but want the site to not have lockin. The One Church theme supports Beaver Builder. Churchly supports Divi, which is similar to Beaver Builder. Kingdom Church supports Visual Composer which is another drag and drop plugin. If drag and drop layout building is important then your best bet would be to use one of these themes. We are going to look into how we might make an official theme that leverages Beaver Builder. We have a developer guide for Church Theme Content. The plugin basically provides post types, taxonomies and fields for theme developers to leverage instead of baking them into their own theme and locking users into that single theme. If you want to learn WordPress theme development, please see the Theme Developer Handbook. I am not totally familiar with how to approach Beaver Builder development so you may want to check with them on that. It could be a matter of making a child theme for their theme or making a totally new theme that leverages their plugin (like One Church). Theme development is a lot of work so there is no simple or easy way to accomplish what you want (not until there’s a practical way to achieve universal theme support with a plugin like ours). We’ve done some research and it looks like the way to go is to create a page template just for Beaver Builder pages to ensure that their page builder will work as expected. This is on our To Do but we have no timeframe. 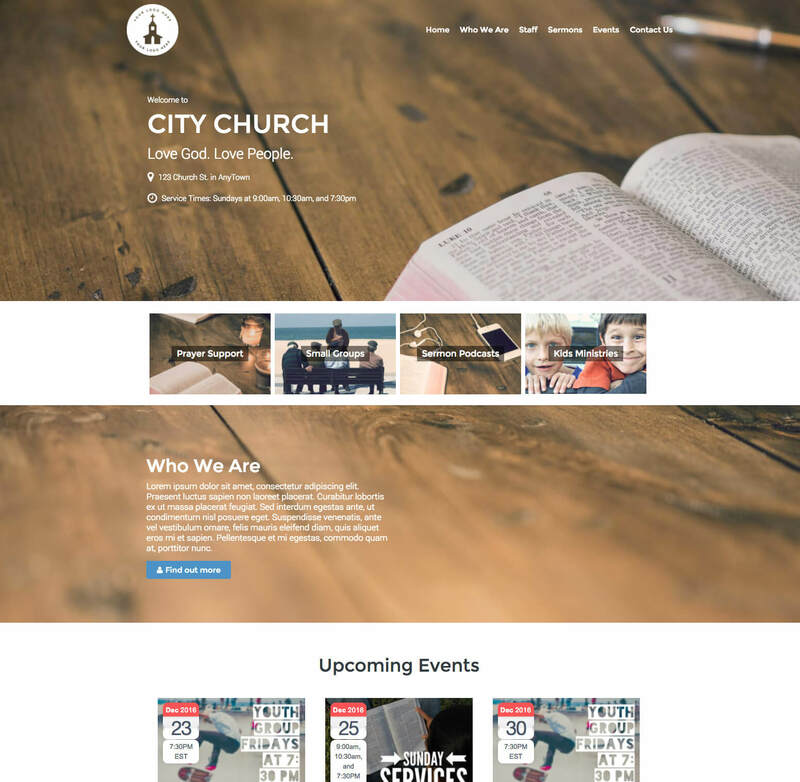 Nice church WordPress themes! Thank you Steven for adding our theme in the list. I always love your plugin which is very flexible to use. God bless you! You’re welcome, Steve. Thanks for supporting the plugin with your theme. Spectacular review article. I am thrilled that there is one offering that attempts to tie the Church Theme Content plugin together with the popular Divi theme, albeit not making use of the CTC multiple locations. If ChurchThemes.com were to develop a Divi Child theme which includes full functionality of CTC then count me in as a buyer! We’re looking at some type of Beaver Builder integration. 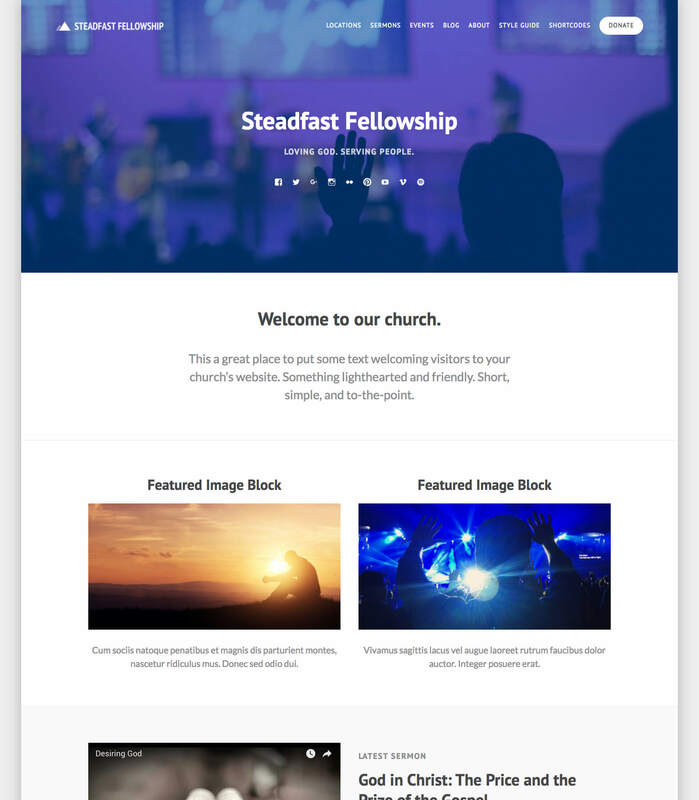 Regarding the free theme, Restful, I have found it helpful to follow along on ThemeBright’s instructions for Steadfast, a paid church theme of theirs that also uses your plugin. Not everything applies, but a lot does. I want to mention one WordPress quirk that gave me trouble and how I think I have solved it. WordPress likes to add -2 to page, post, and category names especially if they were used before, and that was true of the pages I created for Sermons, Locations, etc. I couldn’t get it to change, even after looking for tags, categories, etc. but it seems that installing the free plugin “Simple 301 Redirects” gave me an easier tool than creating a .htaccess file. So when I put /sermons-2/ in for request and /sermons/ in for destination, it worked. I needed to do it this way as I couldn’t find a place in your code to change sermons to sermons-2, and I would rather stay out of editing at that level anyway. Thanks for using our plugin and for sharing your tips about ThemeBright’s free theme and documentation. 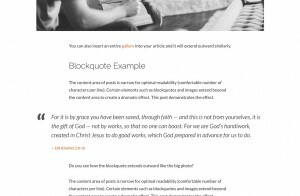 Our own themes will automatically redirect /sermons to the page that uses the “Sermons” template. Other themes may or may not do this automatically. In any case, this should not be a problem for users since you will normally only link them to the actual sermon page’s URL. Would you ever consider integrating with X theme? The guys at themeco are solid believers and are doing an awesome job with their builder cornerstone. Thanks for the consideration!